The Setball is NAF’s V-port ball sector valve with excellent control valve characteristics. A proven design in the pulp and paper industry, the Setball is a high-capacity, versatile, precision control valve suitable for general applications such as service water, steam (with optional “Z” noise-reducing trim) and slurries in non-pulp industries, such as pollution control and power applications. Flowserve NAF Setball can be used in a wide variety of applications and meets the highest demands for control accuracy. Splined connection between shaft and sector minimizes backlash. 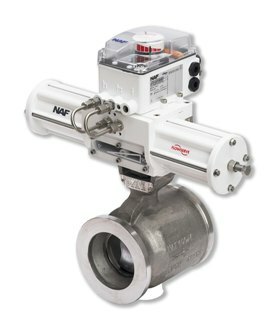 Flowserve NAF Setball is an integrated part in the NAF control valve package with a unique direct-mounting actuator concept. Specialized options, such as a solution for high density black liquor, green liquor or for chlorine bleaching, are available. Our standard stem-seal is the proven dual o-ring design, with conventional v-ring or graphite also available. Hard-plated ball and Alloy-6 faced seat are also standard.